Channelkeeper changes attitudes and influences the water resource management decisions of tomorrow by educating policy makers, citizens, and students about practices that degrade water quality and providing solutions to reduce these impacts. We build environmental awareness and stewardship among youth and adults through our marine and watershed science education curricula, volunteer programs, community outreach and a variety of media. We recognize that young people are the decision-makers of tomorrow and that fostering environmental awareness and stewardship in today’s youth is critical to our planet’s future. Youth environmental education has therefore been a primary focus for Channelkeeper since our inception. Through our Clean Water Environmental Stewardship Training (CWEST) Program, Channelkeeper has provided interactive environmental science education and enrichment opportunities to nearly 27,500 students throughout Santa Barbara and Ventura counties since 2002. Channelkeeper’s CWEST Program provides both in- and after-school science education and enrichment opportunities for local students through a variety of curricula that we provide in partnership with other educational institutions in our community. Channelkeeper’s classroom-based Marine Science Education curriculum teaches underserved students about local marine habitats, water quality, human impacts on the marine environment, and pollution prevention. 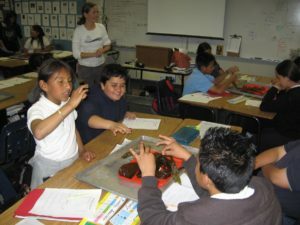 “From Side Streams to the Sea” watershed awareness curriculum (provided in partnership with the Santa Barbara Museum of Natural History) uses hands-on activities to teach students about the connections between human activities, local creeks and watersheds, and the marine environment of the Santa Barbara Channel. Research and Education for Students and Teachers supporting the Ormond Beach Restoration (RESTOR) Program, delivered in partnership with the University of California Sea Grant and Cooperative Extension Programs, provides teacher and student training in water quality monitoring, watershed awareness and wetland restoration. Youth science project mentorship provides technical assistance and mentorship for students conducting water quality sampling experiments and analyses for school science projects and science fairs. Channelkeeper also hosts an annual ocean-themed Student Art Show, “What the Channel Means to Me.” The goal of the show, which is open to high school students from Carpinteria to Goleta, is to inspire local youth to create art that celebrates the Santa Barbara Channel, and for their art to in turn inspire others in our community. Our Seafari Educational Tours program gets kids out on our boat to explore local MPAs and learn about them. Click here for details and to book a tour. Please email info@sbck.org or call us if you are interested in learning more about Channelkeeper’s education programs. Channelkeeper’s youth education programs are supported by grants from Edison, Citrix Online and Union Bank.